Lately, I’ve been on a pickling kick and I currently have in my fridge batches of homemade pickled carrots, pickled red grapes and these lovely pickled prunes. I first discovered the joys of “quickles” years ago when I was unemployed and I discovered a book called “The Joy of Pickling” at the local library. That summer, I pickled cucumbers, green grapes, carrot sticks, green beans and red onions. The thing is that I never actually canned anything…all my pickles were either refrigerator or freezer pickles. It’s easy and the results are almost instant. It’s my kind of work! Lately, there’s been a lot of talk about pickling and almost everywhere I turn, someone is pickling red grapes (Thanks Molly for the inspiration!) So of course, I pickled some red grapes too (delicious) but I also tried my hand at the lowly prune. The prune doesn’t get much respect. It’s associated with the elderly and bodily functions most people don’t mention in polite company, but really, prunes can be quite plump, sweet and tasty. And these prunes prove it. They go well with meats, tucked into a sandwich, or picked at on a buffet table. These pretties were served at my birthday and they were popular. People went back for seconds and thirds and they immediately stopped dissing the prune. Become a believer, give the prune its due. Oh and on a completely unrelated topic, please stop by The Food Network Canada blog and check out my post on Bandidas Taqueria here in Vancouver. Combine all ingredients in a medium sized saucepan and bring to a boil. Lower heat to low and let it simmer for 30 minutes until the liquid has reduced to a heavy syrup. Set aside to cool and refrigerate for up to 2 weeks. Serve cold or at room temperature. that does sound like something I would love. you know what else sounds good? prune chutney…I’ve had that in my mind for a while. I’ve been wanting to try making pickled something! Honestly I’m a bit scared of the pickled prunes but I thought that about pickled asparagus and love them now so I’d give them a chance! this is so up my alley! i would have never thought of it, but i really can’t wait to try it. I’m a prune supporter, this sounds great! How unique! This looks delicious! I always have prunes on hand. You know, for those moments when (…) I’m trying to be polite here 🙂 Anyway, I love pickled beets and gherkins and pickled onions…so I bet I will love these pickled prunes. Something tells me I will soon develop an addiction to these. 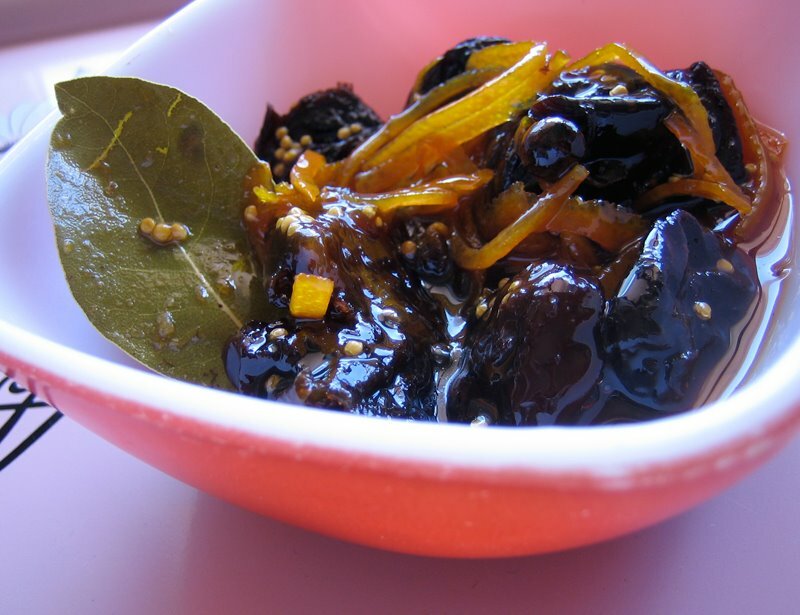 I love the idea of quick and easy…and pickled prunes…who woulda thunk it? I will have to check out that place on Commercial Drive that you blogged about….sounds great. I like unpretentious…. does it get busy? “Quickles” is the cutest word ever. And I would believe that these are delicious…prunes can be luscious! These sound really tasty. Thanks for the idea! Picklicious! It’s about time I get pickling myself. Humm, I have a big bowl of plums at home just asking to be pickled. I’d better get to it! DUDE, we have been dying to do some pickling at our place (after buying some fantastic spicy pickles at the Brooklyn Flea) — and I love the idea of pickled prunes! Inspiring! I made these the other day and boy oh boy are they ever incredibly delicious! I never imagined prunes could be so versatile! Dawn, prune chutney sounds amazing! eatme, give it a chance! they’re not traditionally pickled….more like a whole fruit chutney! megan, let me know how it goes! i agree, kasey. as for the grapes, so good! rah rah prunes!! yay, brilynn! bijoux, i think you’ll love them! hag, i’ve always had luck finding a table but i’m sure it will be a hopping place soon as the word gets out! haha, i agree too, maggie! hayley, they are pretty tasty! try them out. jess, let’s hop on the pickling bandwagon together! cookiepie, i can’t wait to see what you end up pickling! bijoux, so glad you tried them out! yay!! 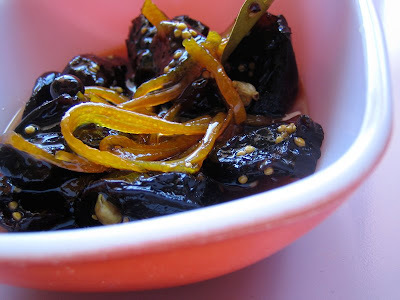 I really want to make these, especially with my bag of disappointing Costco prunes wasting away, but I feel lazy about getting all those spices I might never use again. Prunes are the best! … and I’m under 30. They are a big part of Provencal cooking and they are delicious…especially with orange. Tis the season for the quickie pickle, I’ve got shredded red onion, carrot ribbons, cauliflower and sliced cucumber going right now… but I never in a million years would have thought to pickle prunes, you’re genius! Lydia, just use spices you already have, like cinnamon, cloves. Or buy the spices and you’ll always have lots of chai tea! Pierre, hooray for quickie pickles! YUM!!!! 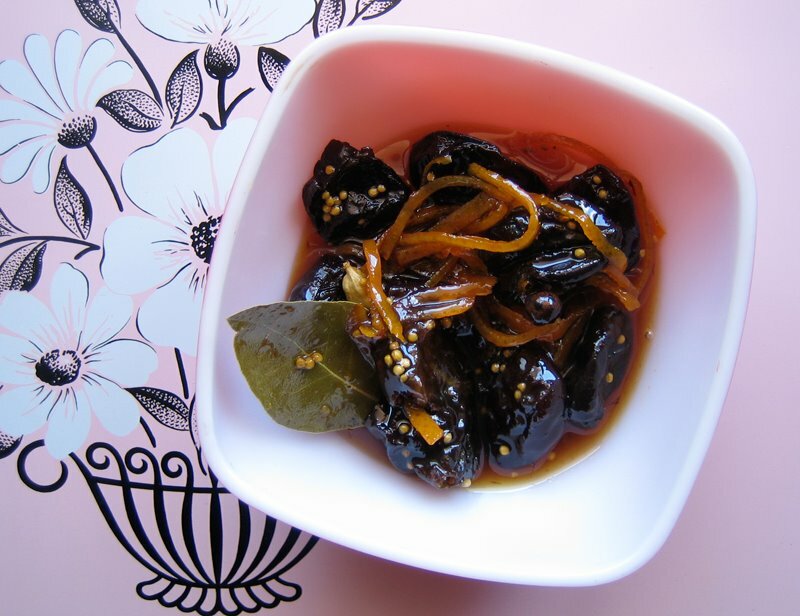 Love the pickled prune recipe, thank you.